Sometimes it feels like poets are magicians. They create texts that are baffling and beautiful, building poems out of phrases and events so obvious that we smack our foreheads wondering why we didn’t think of that. CAConrad, on the other hand, gives his tricks away. Conrad uses (Soma)tic rituals designed to create for the writer an “extreme present” in which to create poems. “Soma” means “body” in Latin, so a radical, physical presence makes sense describing these rituals; but “soma” also refers to an intoxicating drink of immortality in ancient Vedic and Zoroastrian traditions, and the layer of altered mental states adds to Conrad’s definition. Each of these rituals is described in Ecodeviance just before the poems they inspire. Conrad conducts workshops of (Soma)tic rituals and says, in an interview at Monkey Bicycle, that dancers and painters have participated in his workshops, dancing or painting rather than writing. Every once in a while I think something about a stranger on the sidewalk and they dart a glance at me and I get it—I GET IT—we are one! Allow seven consecutive days for this exercise. DAY ONE, think about a woman you know, think about experiences you have had with her. Think about conversations you have had, think about the things she wears, eats, her way of walking, her laugh. Think about every detail you can imagine. See if she calls you or emails you. Take notes about this attempt at psychic connection. (Soma)tic rituals solve the problem of how to be present for the work of creating, how to make something without overthinking it—or because you’ve overthought it and there’s nothing left to do or think except the poem. (Soma)tic rituals make space for the artist to be exposed and create out of that vulnerability. Conrad puts the ritual in the foreground, listing only the title of the twenty-three exercises in the table of contents, not the poems they bred. Further, each exercise is described before the poem is given; in doing so Conrad pulls back the curtain and invites us to create with him. What can I make using this or that ritual? What rituals can I make for myself? The reader is forced to imagine the possibilities of the poem before reading it. 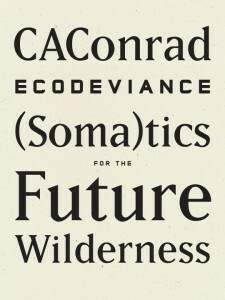 About halfway through Ecodeviance Conrad writes, “an owl drops a mouse in front of me / it doesn’t have to mean something / but it probably does”, which feels like a manifesto of sorts, and a celebration of (Soma)tic rituals. Because each of the poems has come from the Conrad’s sub/unconscious mind there are layers of meaning that are unraveled upon further reading. The almost complete lack of punctuation encourages multiple ways to read each poem. Notice the way the first half of the poem is curved like a river, perhaps formed by the “billion / tears an hour the human / race” produces. The poem resolves into a straighter shape, and “seem[s] to / make sense”. Conrad’s (Soma)tic rituals reinvent the world and his poems surprise the reader who imagines them before reading. Conrad gives us permission to be wild, to drop margins, to make sense and meaning, or not. CAConrad might be the best poetry teacher we have. I’ll claim him as mine. Who are your teachers?